Contrary to popular belief, making Indian curries is actually a very simple and relaxing process, adding a dimension of depth to so many unexpected dishes! Madras is one of the mildest and most beloved and totally kid friendly, especially with the added sweetness of mangoes. Curry is basically a generic term attributed to dishes using a slew of regional distinctive fresh herbs and spices such as turmeric, cumin, coriander, fenugreek, and chilies to name a few. There are red and green curries, exotic Arabic style curries, curries with coconut and curries so hot your tongue will burn up. They are made by pounding or grinding together herbs, chilies and spices to create a base for a list of wonderful and fragrant sauces and additives to meats and soups and salads. 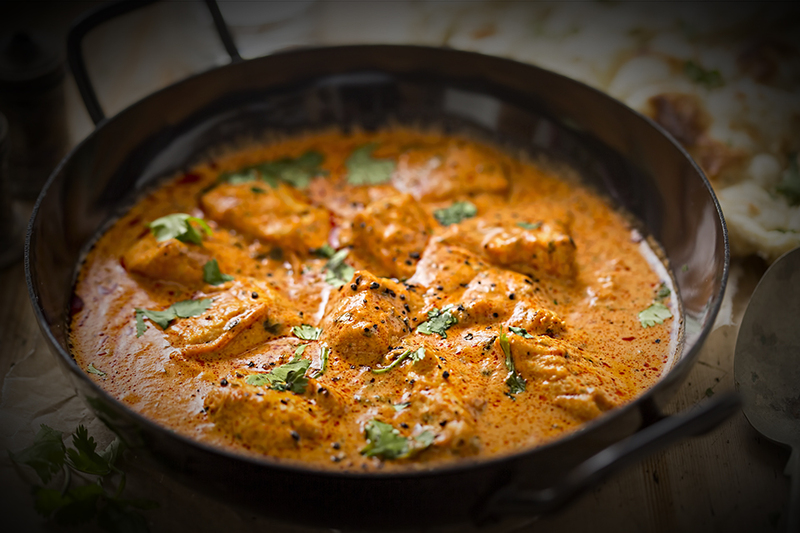 Madras curry was invented in Britain, by Indian immigrants working in British restaurants, based on a dish from the Madras region and altered by what they had in merry old England. Our version also alters the dish, by adding mangoes. Warming spices and sweet mangoes make this a perfect dish for winter. Mix together all ingredients in a small mixing bowl, making sure that the dried chili pepper is ground up well. Store in an airtight container for up to 2 months, preferably in a dark and cool location. Toasting the whole spices first and then grinding gives a deeper richer flavor to the spice mix and dish! In a large Dutch oven or heavy bottomed soup pan, heat canola oil to a medium high heat. Sauté the garlic, ginger and red chili for a few minutes. Add the onions and curry leaves and continued to sauté for about 3-4 minutes or until the onions begin to get slightly translucent. Add the beef and sauté until all sides are browned. Sprinkle the curry mix over the top and season with the salt and pepper, stirring constantly as the mixture will begin to stick to the bottom of the pan. Add the lemon juice, mango puree and the tomato paste and mix well, scraping any of the stuck bits on the bottom of the pan. Add the tomatoes and continue to do the same. Turn heat to low or a simmer and add curry leaves and broth. Cook on a low simmer for about 30 minutes or until the meat is tender. Serve over basmati rice, and garnished with a dollop of yogurt.